The Starburst slot machine offers a surprising number of options. It does not have as many features as some other games, but the features that are available are so special that they give players more than enough ways to win big. This is one of the most popular games in Kroon casino. Although the game looks simple at first, it has some exciting surprises in store, which draws in all kinds of players. 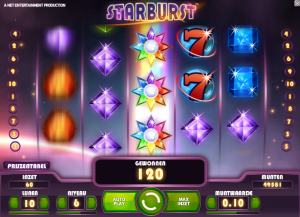 Furthermore, the Starburst slot machine was developed by Netent, so players are guaranteed to play a high-quality game. One of the most notable characteristics of the Starburst slot machine is that the game allows winning combinations from both directions. Most slot machines only reward winning combinations of at least three symbols, as seen from left to right. This slot machine, however, also lets players win money with winning combinations that appear on the reels from right to left. In total, ten win lines are available on five reels, although the option to win both ways does give players a bigger chance of winning. It is quite common for a winning combination to appear from right to left on a machine that only rewards left-to-right combinations. That does not matter on this slot machine, because you will win either way: from left to right and from right to left. Being able to win both ways is just one of this slot machine’s special features, but there are more. There are also special Starburst wild symbols that play a unique role. These symbols can only appear on reels 2, 3 and 4. When one of these reels shows a Starburst wild symbol, the player has a chance to win big. The wild symbols fold out across the entire reel and can replace all other symbols, which means there is a really high chance of winning. That is not all, however, because the symbol also makes the reels spin all over again. Not only will the player have a higher chance to win, they will also get another spin for free. The wild symbols can offer up to three new spins when a winning combination appears. The player can decide how much to bet on the Starburst slot machine. The lowest possible bet is 0.01 euro and the highest best is 1 euro. This game gives players a chance to win up to 50,000 coins with a single bet.